When Life Hands you Lemons-Make Sweaters! and it looks great on me. Hmmm, was this a subconscious decision? In any case, all’s well that ends well. To top it all off, sweater #4 turned out just fine. The sleeves might be a tad too long. 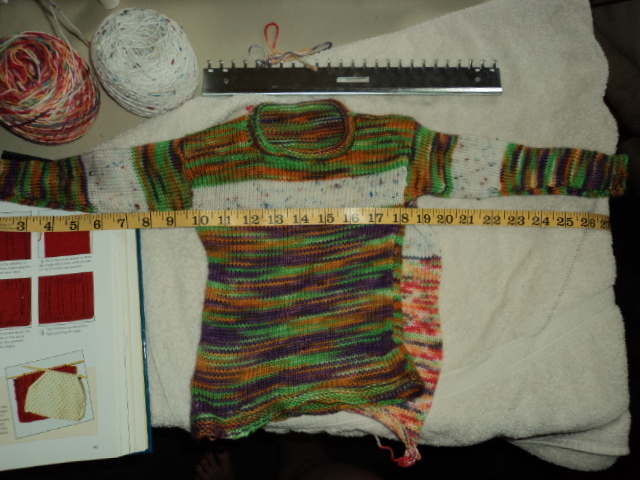 I followed schematics from “The Sweater Book”, following their pattern for increasing sizes, I decreased the size. According to that, the sleeves should be 10 inches, the boys actual arms were only 7 inches. That’s ok, they can be cuffed. All’s well that ends well. No pictures, just tears. I do know to make a test swatch. I really do. I did. 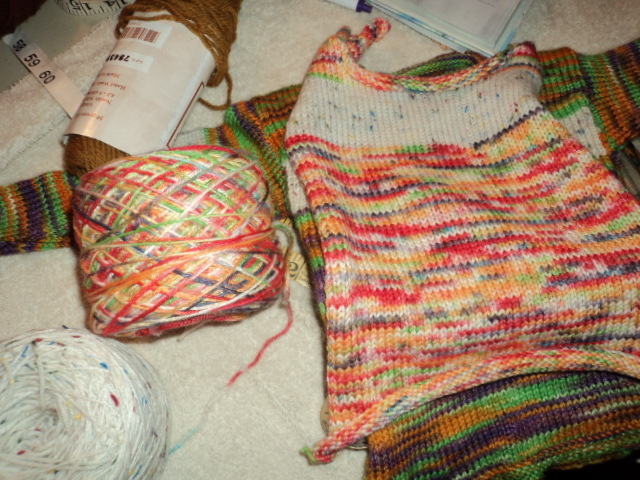 However, my mathematically challenged brain, and my overzealous hurry to make a sweater ended in disaster, three times. This last time, I was determined not to make an itty bitty sweater. So I didn’t. After I lengthen it, it will fit me nicely. It will not fit a child. *Sigh* It would be too short, anyway. I haven’t given up though, I have more yarn. This time I will use a book to go with my gauge swatch, to tell me how many to cast on. I had a gauge, what was I thinking? Gauge swatches are not enough. You need to translate that into sweater dimensions well, and apparently, my ability to do that is lacking. Not to mention I have both books and software to help me AND I DIDN’T USE THEM! Grrrr. Or Duh. Or both. What can I say, I love puns. 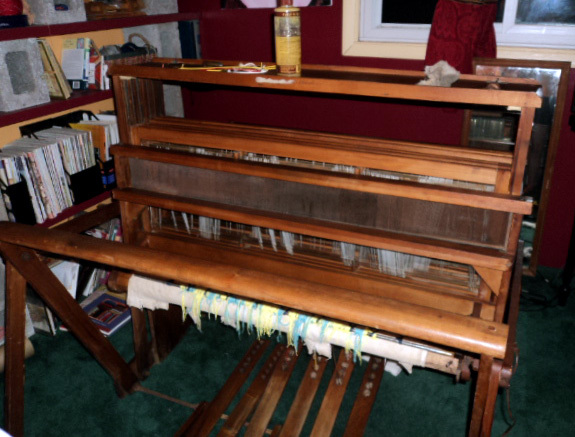 So I am going from a relatively simple Schact, 15″ 4 harness table loom to a nameless 43″ six harness floor loom. "Me eat you for breakfast." While I am excited and grateful for the opportunity to expand my skill, this is an intimidating machine. I am awed by the fact that some nameless person was able to design and manufacture such a complicated piece of equipment. You can tell some of the pieces were recycled from something with words stamped in it, and the holes in the foot treadles look as if they were hand carved. The back beam is pegged on, and is removable for easier warping. I’m not sure what my first project will be. I have one or two things I have been waiting to make, but I’d like my first on on here to be rather simple and short, to get the hang of it. This is why your stash can never be too big. You never know if there is an emergency sweater lurking in the future. If this one doesn’t work, I’ll have to mail one to him. I’d really like to be able to hand them something hand made when they get here. On Thursday. This Thursday. Three workdays from now. That leaves me, oh, five hours if I’m lucky. 8 if I short myself on sleep. Oh well, I’ve never been one to let reality get in the way. 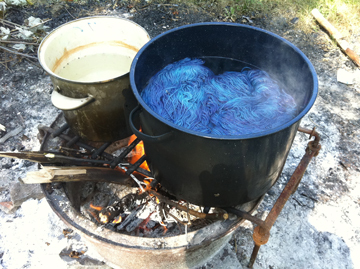 Just in case you thought this blog was never going to talk about fiber, we had a dyeing day recently. 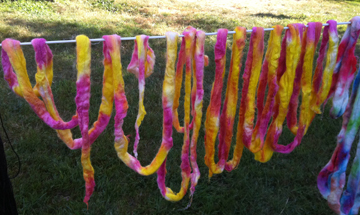 Do you know just how many jokes you can make about dyeing? 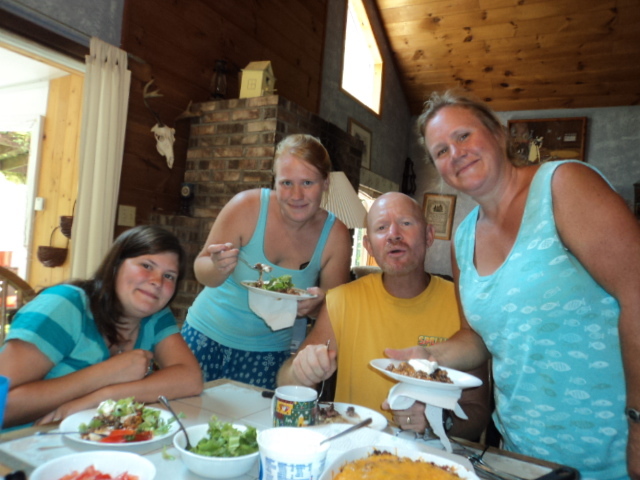 We had a lot of fun, and got some beautiful colors. I did kool aid and some different acid and food dyes. 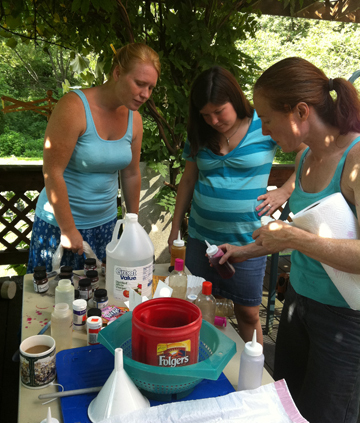 Some of the others really got into the Wilson cake dyes. Those are amazing. 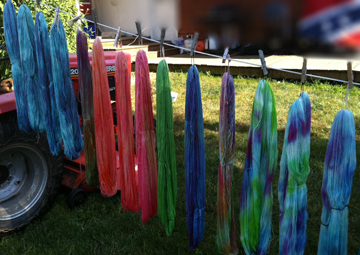 If you don’t stir much, the colors separate as they strike, making some of the most beautiful yarn. Unfortunately, I was too busy to take many pictures, and the others posted theirs on Facebook. I don’t know if I can copy them from there. 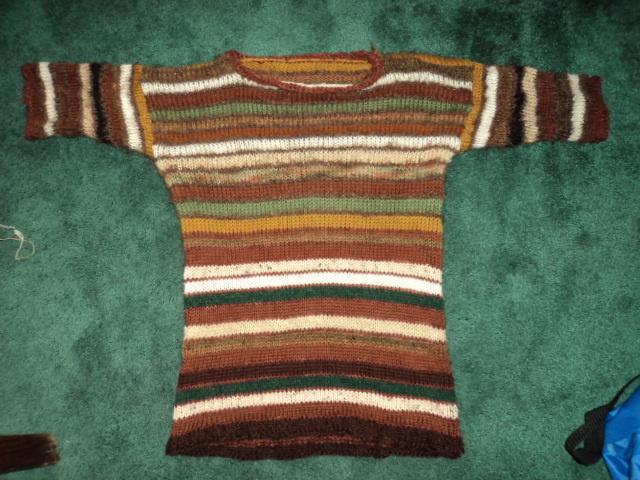 I did take one picture of my sad sweater I made from my experiment. 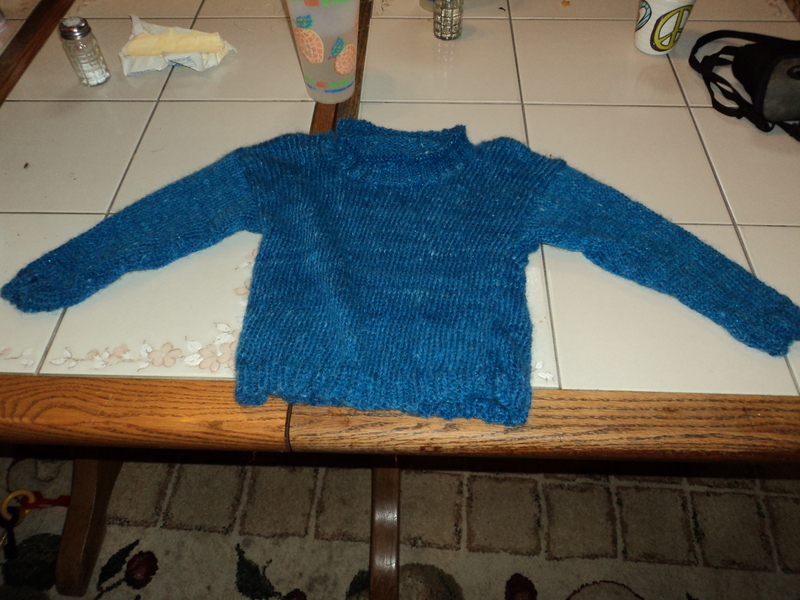 I say sad, as I really have a problem with size, and as you can see, while it is supposed to be a baby sweater, it will only fit a very small baby with long arms. and possibly a small head. I have since found out that the 11 month old I am making this for is just shy of 4T, changing my plans completely. 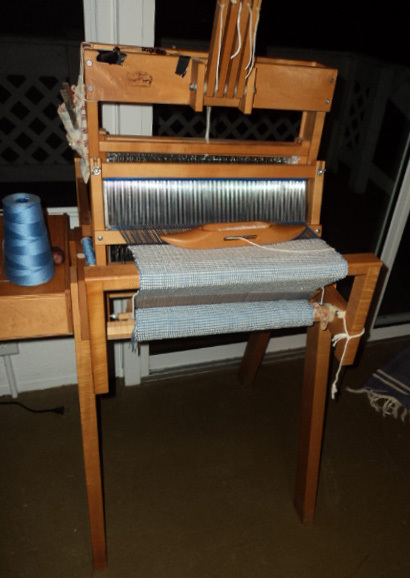 More about that and the LOOM I GOT in my next post. After I get some sleep. 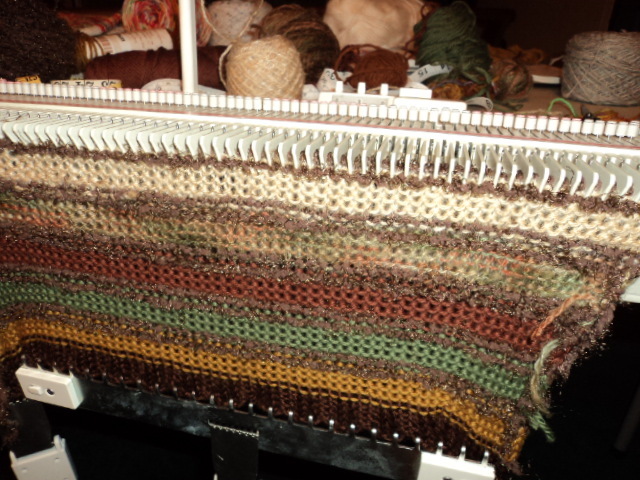 Wait till you see this loom, it is amazing. It isn’t a brand name. But you’ll have to wait. Until I get some sleep. Did I mention I was tired? sad, sad sweater. What did you want to be when you grew up?